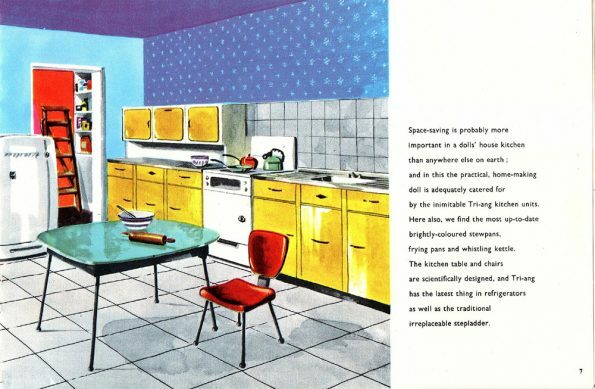 Space saving is probably more important in a doll’s house kitchen than anywhere else on earth; and in this the practical, home making doll is adequately catered for by the inimitable Tri-ang kitchen units. Here also, we find the most up-to-date combinations. 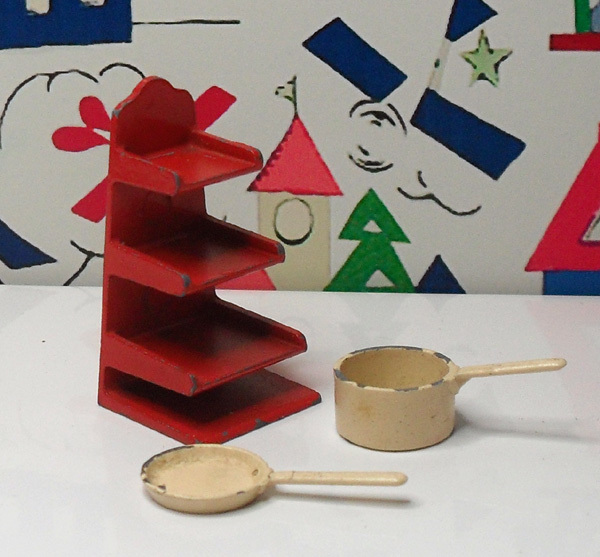 A very useful item for any modern kitchen, made of moulded plastic with various shelves and drawers. This is the metal base of the Dishwasher, it is one of the few items that is marked as being made by Triang. I think this has been repaired at sometime, you can see the glue marks. 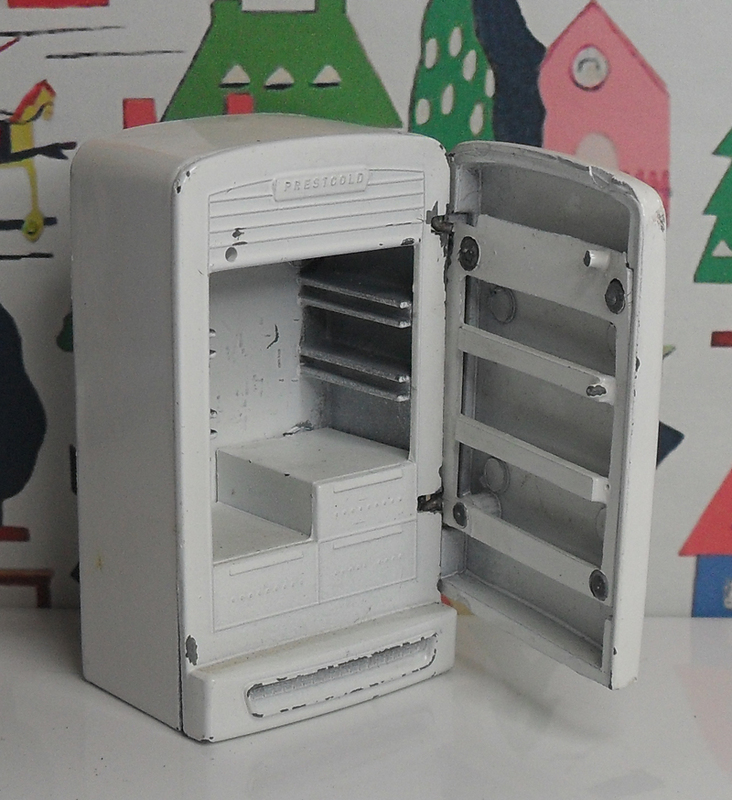 This washing machine was produced in great detail, showing the controls and hoovermatic label. It also came with a hose, which mine does not have, long gone I expect. 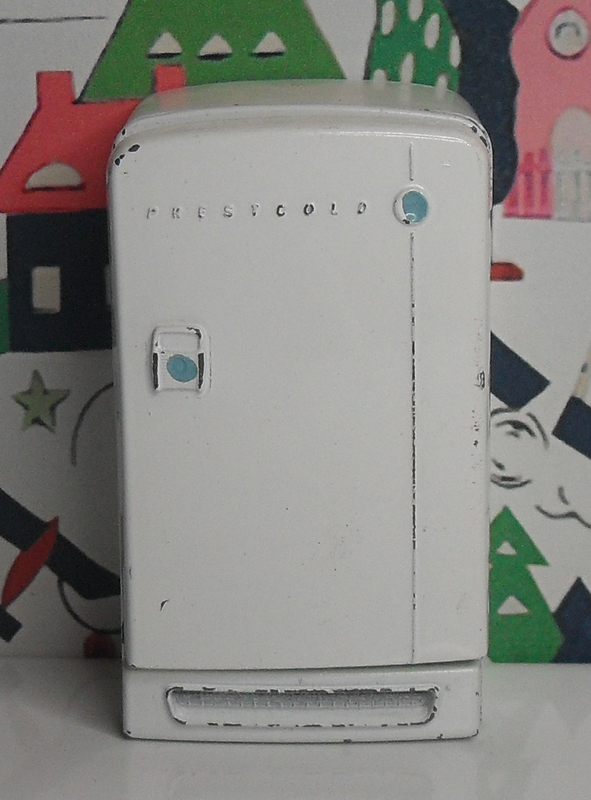 This Refrigerator is metal, showing the Prescold logo. The inside fittings are plastic with two shelves, mine does not have any shelves. 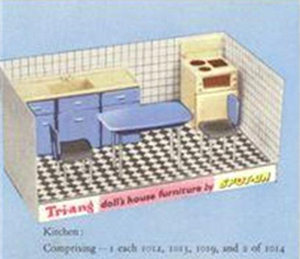 Space-saving is probably more important in a dolls’ house kitchen than anywhere else on earth; and in this the practical, home-making doll is adequately catered for by the inimitable Tri-ang kitchen units. 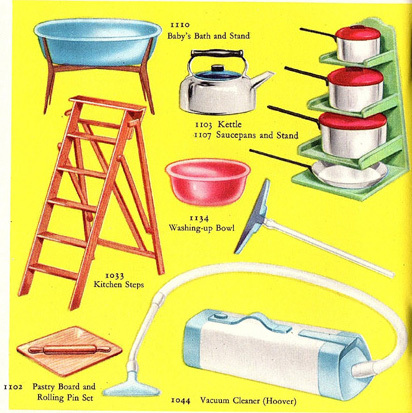 Here also, we find the most up-to-date brightly-coloured stewpans, frying pans and whistling kettle. 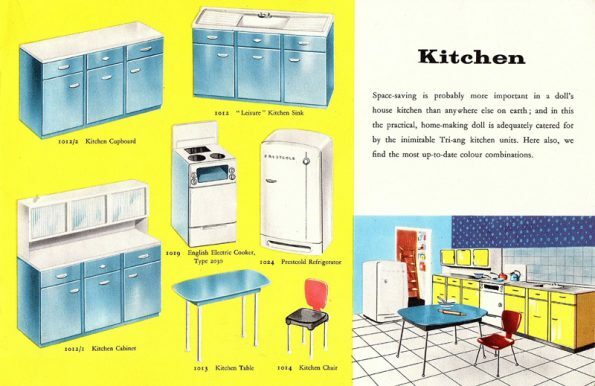 The kitchen table and chairs are scientifically designed, and Tri-ang has the latest thing in refrigerators as well as the traditional irreplaceable stepladder. 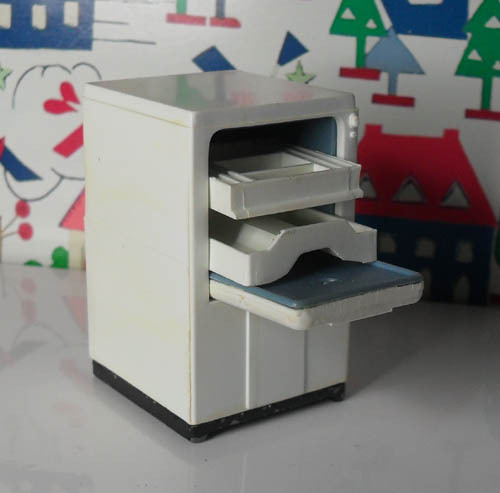 The earlier sink units are blue and have a cream top, later changed to white. 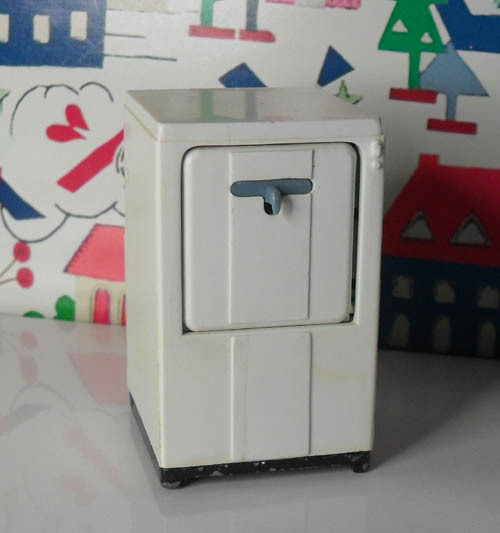 It is made from metal [apart from the top which is plastic] the two side drawers and cupboard doors open, it is quite a heavy piece. 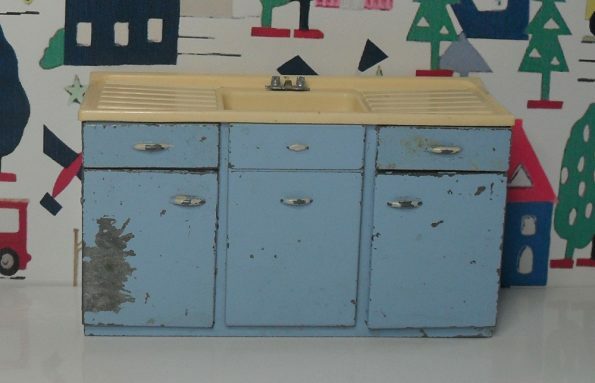 This is example of an early sink, but it is not in very good kitchen. 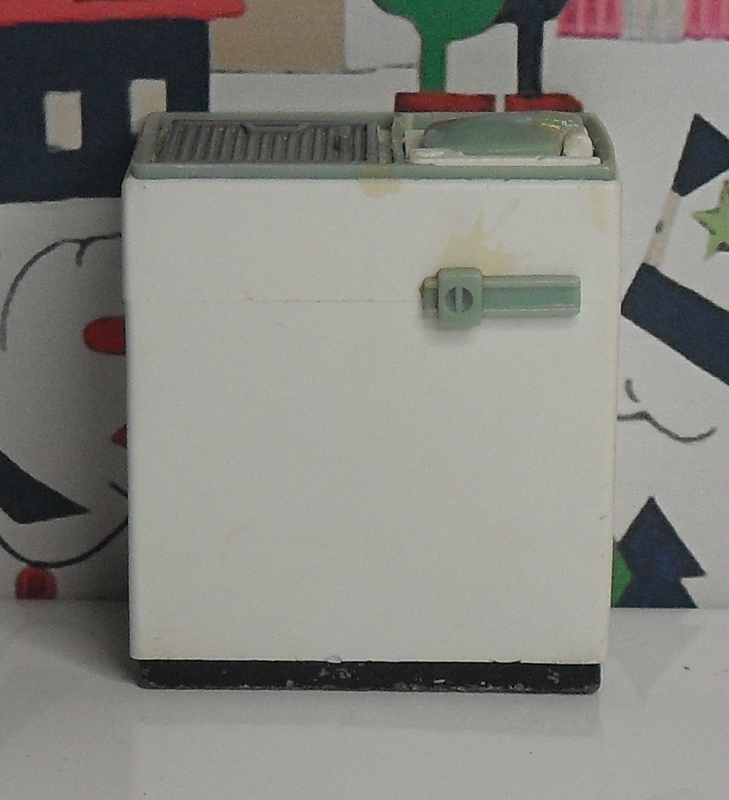 The later model of sink unit kept to the same basic style, sink tops and colours would change. 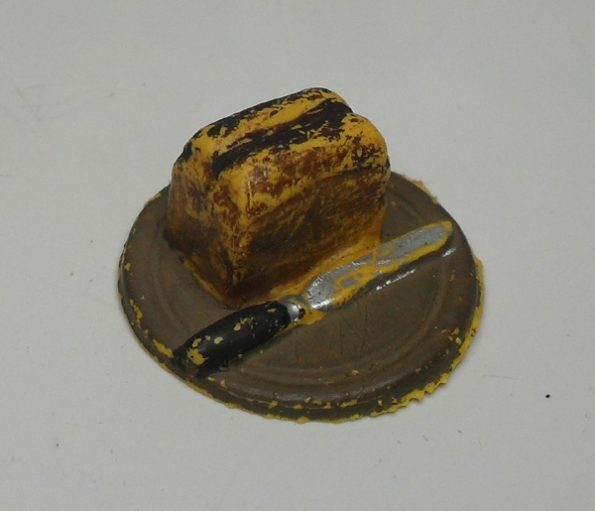 There was also a gradual change from metal to plastic. 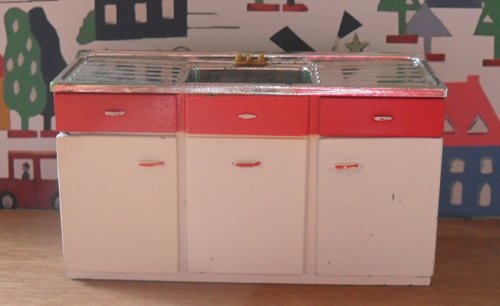 The above sink unit is metal with plastic doors and drawers. 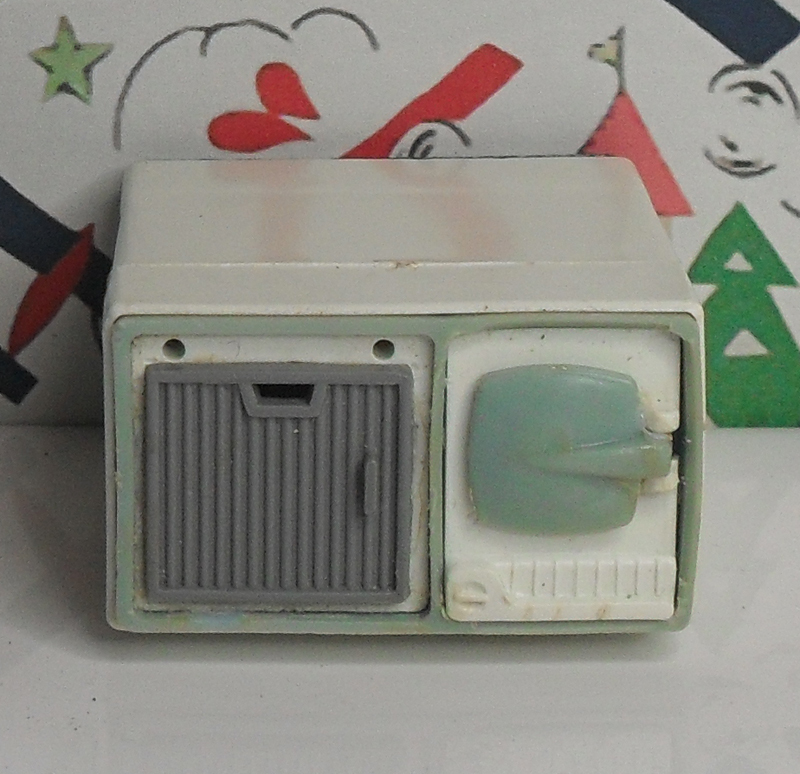 The base of this units is metal with two side opening doors, it has a blue work surface. 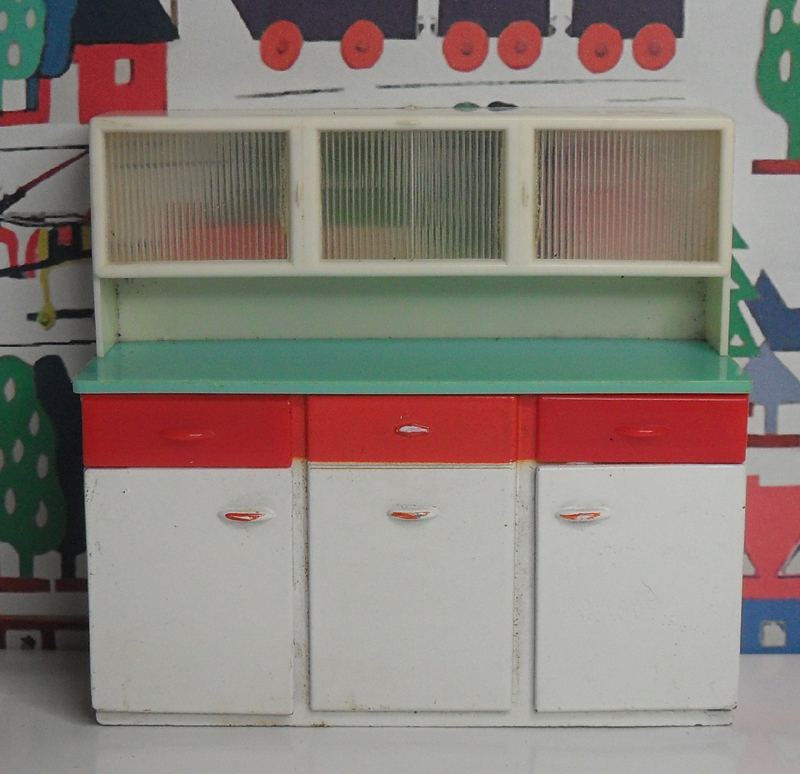 The top shelf with ribbed obscure plastic glass is made of formed white plastic. 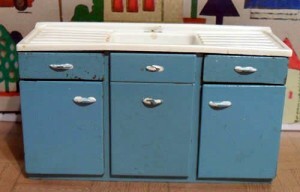 Only the two side drawers open, the middle one is a blank. 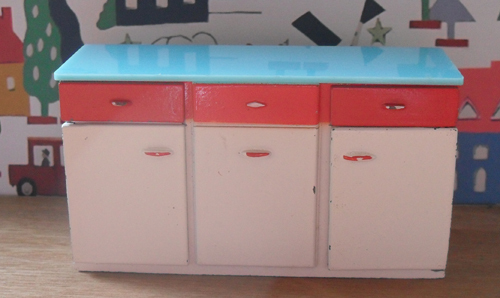 The Jenny’s Home Kitchen Cupboard has still retained its metal frame, but the cupboard doors and drawers are now plastic. The middle drawer is now a red blank without a handle. The worksurface is also a bit thicker. 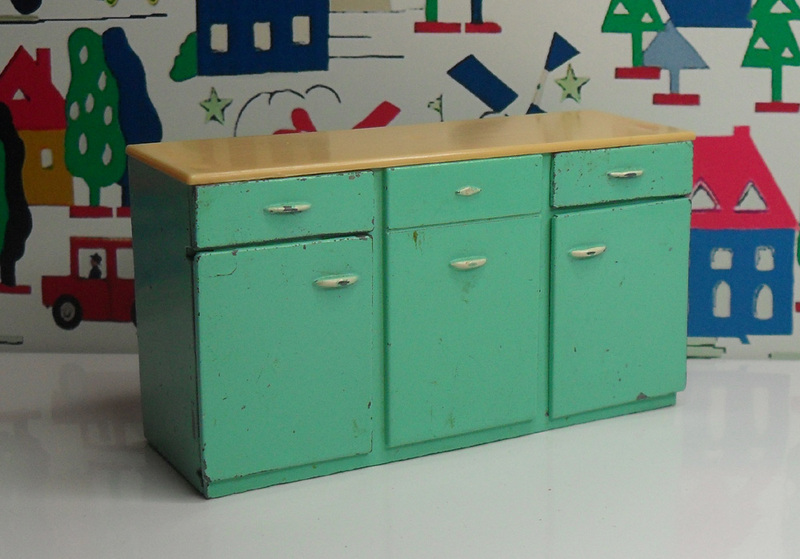 The above Kitchen Cabinet is quite and unusual colour , being green. 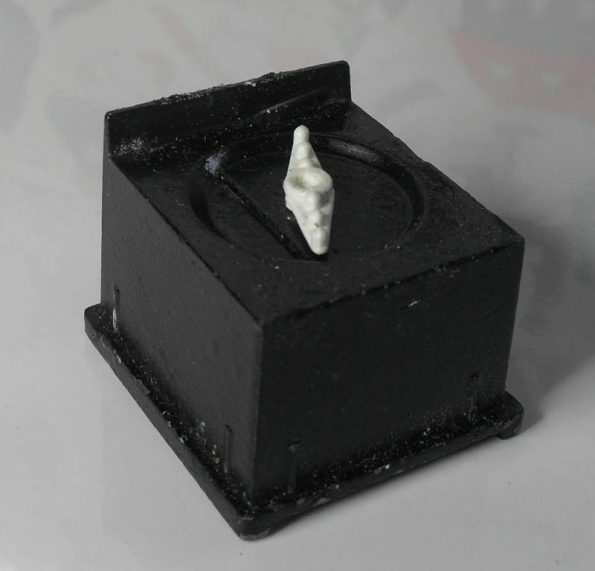 The cream top being an early version. 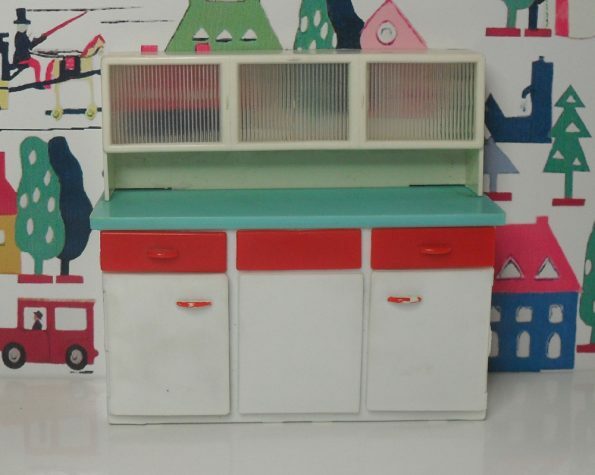 This Cabinet seems to be the base unit for all cupboards and sink units in the range, as with others colours changed, and the move from metal to plastic. 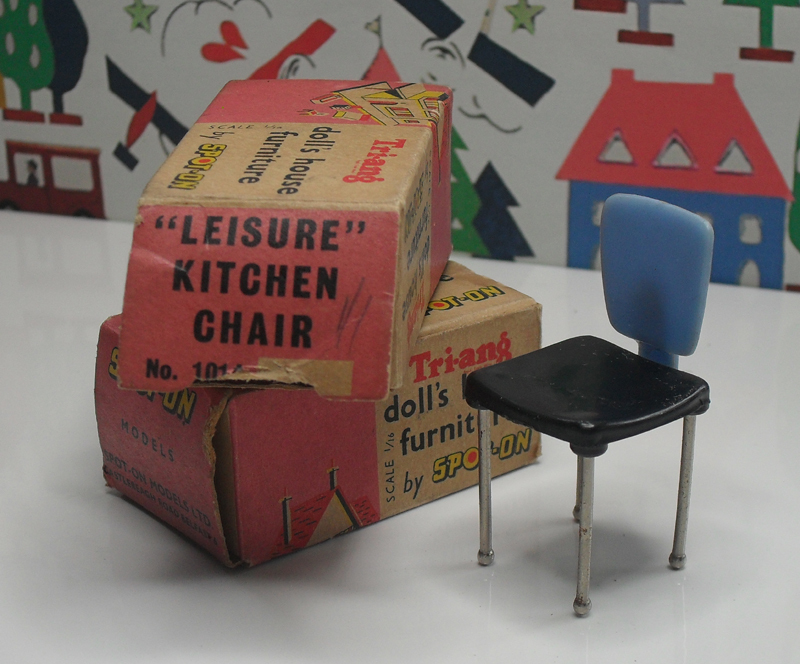 The Leisure Kitchen Chairs came with boxes, they were a tight fit. 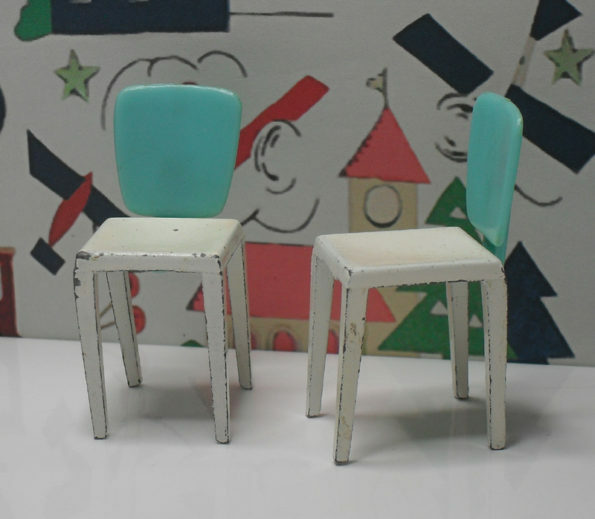 The Leisure Kitchen chair was made of moulded plastic, with neat little metal legs fitted in. This range did not carry on to the Jenny’s Range. 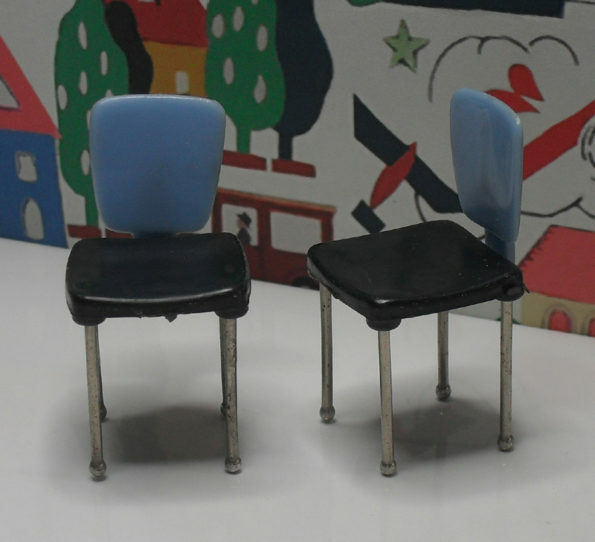 The Utilty Chairs were produced under the Jenny’s Home Range, replacing the Leisure Kitchen Chairs 1014. 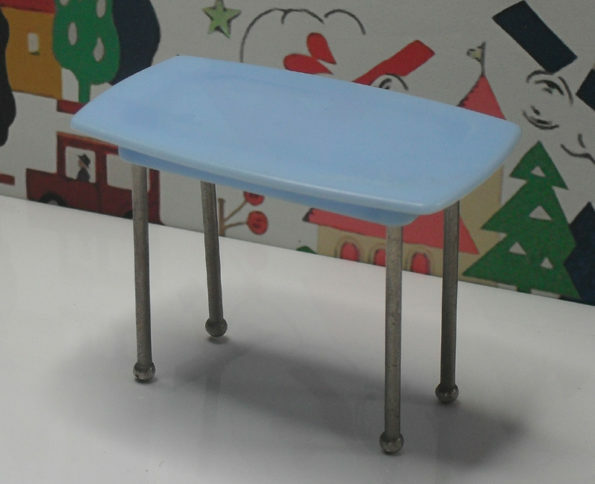 They are a metal frame painted white, with a blue plastic back. This table matches the chairs above, and this strange style is at its best with the chairs around it. 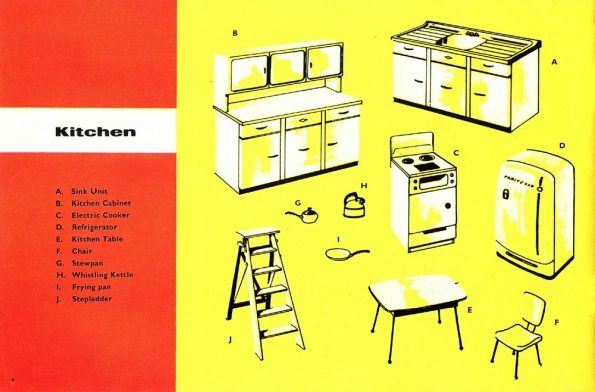 The Leisure kitchen table changed in the Jenny’s Home Range. 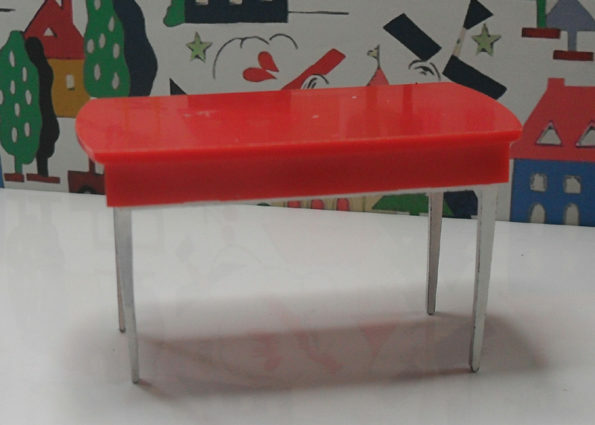 Made with a red plastic top, and white metal painted legs, still very pointed. The Ascot Heater does not have number. 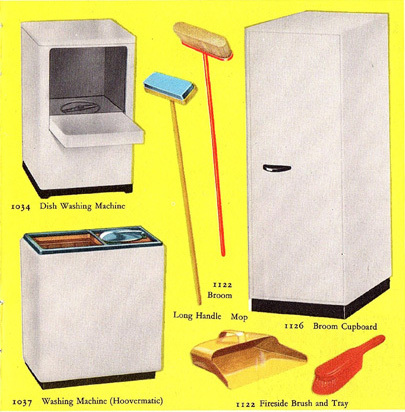 The Ascot Water Heater is one of the few items of Triang furniture which is labeled as being made by Triang. 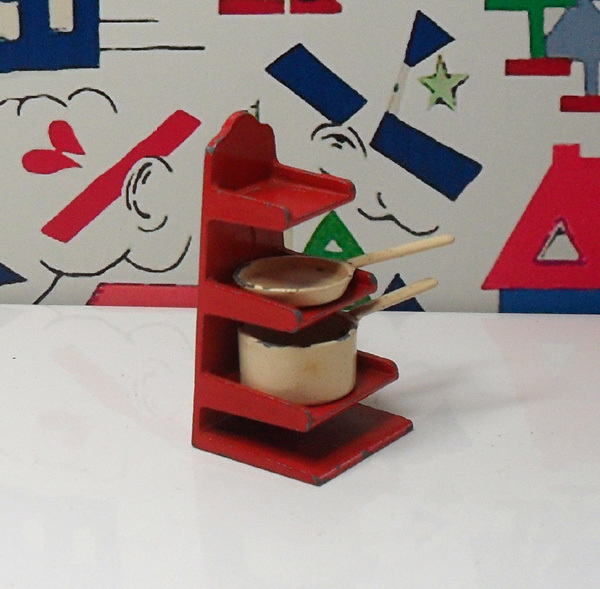 The little saucepan and frying pan came with this stand, but I am not sure if they are Triang. I don’t have any complete food packs, just a few odd items. 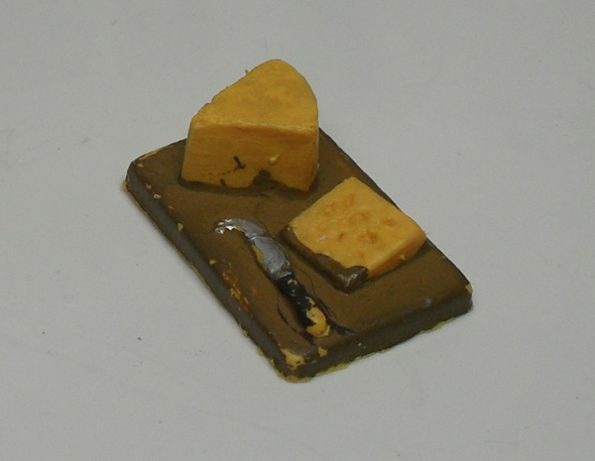 Both of the above items come from Food Pack No.2 1139 [JH35], Grocers and Bakers Set. 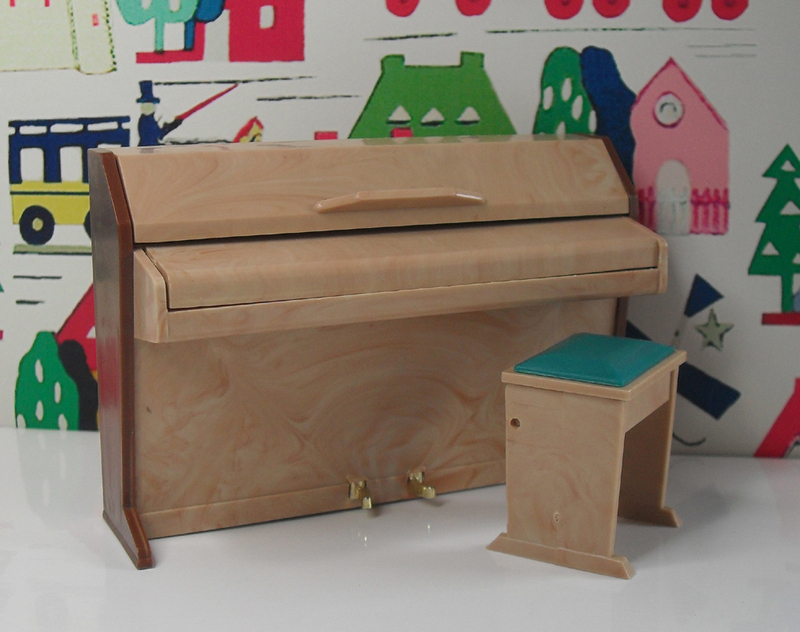 This set carried on into the Jenny’s Home Range. 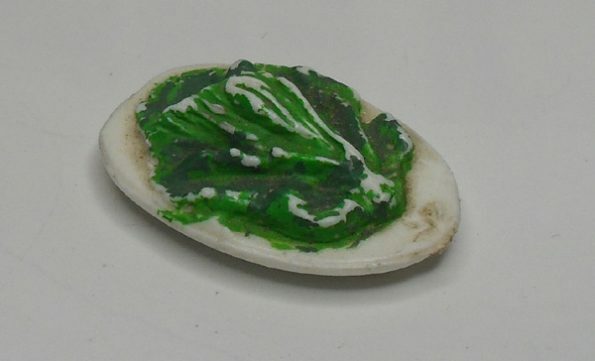 The plate of Lettuce is from Food Pack No.1, 1138 [JH36], Vegetable and Fruit Set. 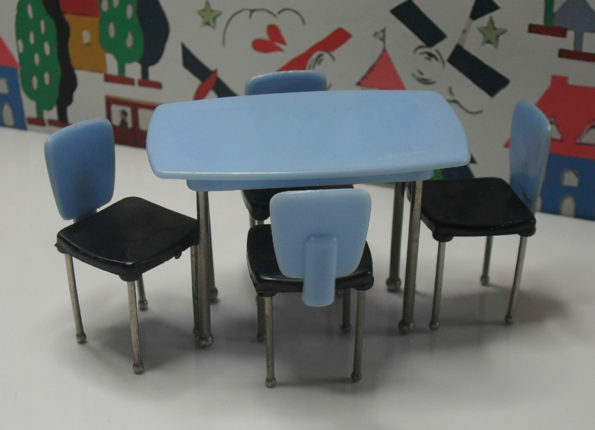 This set also carried on into the Jenny’s Home Range. Interesting to see the choice between metal and plastic.As a child I would have wanted the realism of metal, but now I rather like the way the plastic goes with the modern look of the ’60’s.